Bamber Bridge aim to put the brakes on a slump in form when they make the trip to Ossett Town tomorrow. The Irongate outfit have lost four games on the bounce, coming off the back of three straight victories. 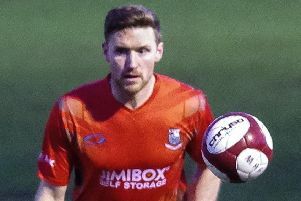 Brig boss Neil Crowe saw positives in Tuesday night’s 2-0 defeat at Kendal Town, offering him encouragement for the Ossett clash. Crowe told the Evening Post: “We are on a bit of a poor run at the moment, that goes without saying. “In the first three of those we were pretty poor but the other night at Kendal, I felt that the lads were unlucky. “The bigger picture of that game was that we were the better side, only for two mistakes to lead to their goals. “We had some good chances but couldn’t put them away unfortunately. “If we can repeat that general level of performance and be a bit more ruthless, we should be all right. “Our slide in form started against Clitheroe, who beat us 4-1 at our place. “They were better than us on the day, sometimes you have to hold your hand up and accept that. “At Radcliffe Borough we huffed and puffed without really getting anywhere. “Then we let ourselves down against Trafford in the FA Trophy last Saturday. “We are not at full strength at the moment – at Kendal we were without George Bowyer, Lawrence Hunter, Michael Potts and Alistair Waddecar. “I’m sure that we can get ourselves back on track because I know what the lads can do. “We went on a great little run a few weeks ago when we played some great stuff. “The longer a bad run goes on, the harder it is to get off it. This will be Brig’s second visit to Ossett Town in a month, having beaten the Ingfielders 1-0 in the FA Trophy on October 10. Said Crowe: “Ossett had a good win over Scarborough on Tuesday night. “The pitch over there is not the best and they will make things hard, get in our faces. Brig’s quartet of walking wounded will be assessed ahead of the game. Crowe has been impressed with the performances of Clive Smith since the teenager arrived from Preston. The defender is on loan until January, Brig very pleased to obtain the services of a player who has come through the youth ranks at Deepdale. “Clive is doing fine and I thought he had a great game for us at Kendal,” said Crowe. “We changed system there, went 3-5-2, and he looked good at wing-back with loads of energy. “It’s been tough for him with us losing the three games he’s played here but his attitude has been spot-on. “You can tell Clive has been brought up properly at PNE – he arrives early for training and games. Elsewhere in the NPL First Division North, Clitheroe host Glossop North End, while Burscough are at home to Tadcaster. Kendal face Prescot Cables at Parkside Road.